Investors weren't impressed enough with Tesoro's plans to capitalize on renewable fuel regulations to overcome the malaise for refining stocks. 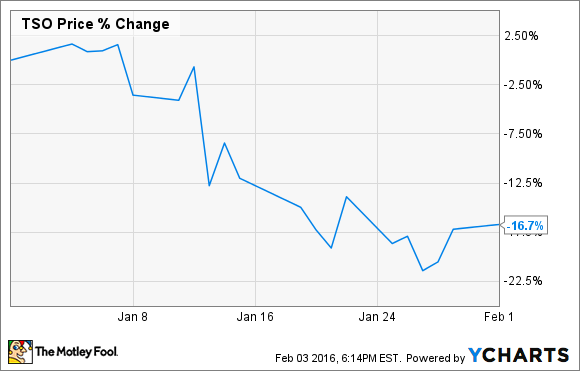 What: Shares of refiner Tesoro (NYSE:ANDV) declined 16.7% in January as lower refining margins started to sink in. This was in the face of Tesoro's recent announcement that it plans to work with several biomass companies to develop biocrude from renewable biomass. So what: One of the major costs for refining companies in recent years has been credits for the federal renewable fuel standard. This is a mandate that requires a certain amount of fuel such as gasoline and diesel come from renewable sources such as biofuels and ethanol. For years the primary source of renewable fuel has been ethanol from corn, but it's not exactly a perfect solution. On top of that, Tesoro's large California operations have to comply with California's low-carbon fuel standard. So earlier this month, Tesoro announced that it was teaming up with several renewable-energy companies to convert biomass into a biocrude that can be used in refineries. This is an important distinction because most renewable fuels produced today are a refined product. If Tesoro and its partners could develop a more crude-like biomass product, then refiners could reduce their compliance costs with the federal standard and could even generate credits under the California law. As promising as this venture might sound for the future, investors were a little more interested in the short term in January. According to Scotia Howard Weil's weekly refining report, refining margin indicators in every region of the U.S. have compressed in recent weeks, and that suggests Tesoro's profits for the quarter will be lower in the coming quarter. We already saw the effects of lower refining margins, as the company was unable to meet expectations for fourth-quarter earnings. Now what: These two things, renewable fuels and refining margins, are on the exact opposite sides of an investor's time horizon. Those with a close eye on refining margins are probably looking for short-term gains, while the development of alternative biofuels will likely take years to pay off for the company. As an investor, you need to be able to determine what are the factors that are more important to your investing time horizon. Shares of Tesoro have had a good run over the past five years, but shares in prior quarters were looking pretty pricey for a refining stock. Now that Tesoro has slid a little over 30% over the past few months, perhaps this period of weaker margins will present a more attractive buying opportunity for someone looking to capitalize on a company looking beyond the normal scope of an oil refiner.